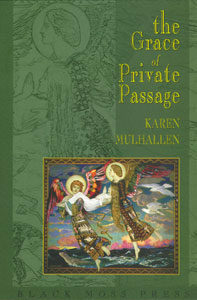 Karen Mulhallen gathers much of her inspiration in this newest book of poetry from her travels, leading us on a fascinating journey around the world, into history, and narrative. Gradually we find ourselves guided back into some ancient poetic forms. This rich global odyssey takes us from the mountains of Alberta, where the elk are birthing, to the rain-forests and oceans of Australia, and the streets, museums and countryside of Scotland. Hold tight now. Go on, Go on.